Now Create New Account or Login with Your Detail. As You created or Login In my airtel app Come To Home Tab in App. 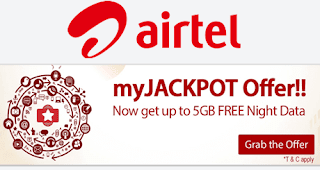 You See My Jackpot- Free 5 GB Night Data Offer. On click Redeem You Will See Some Offer To Avail Such As. Recharge now & get free data. Listen to wynk music for 4 days & earn 500 mb net. Load 100 Rs to wallet & get 500 MB 3G data. Download Sultan game for free 500 mb internet. Now You Have To complete all The Above Offer To Claim 5 Gb Night Data. As You Complete the all above offer You will Receive confirmation message with 5 GB internet Data. Congrats ! Now Enjoy This data at 12 AM to 6 AM.